Have you ever thought about whether there are souls in Minecraft Bedrock? Soul Flasks are magical containers that can contain the souls of living beings inside. Having received such a bottle you can take the soul of almost any mob in MCPE and then release it elsewhere. 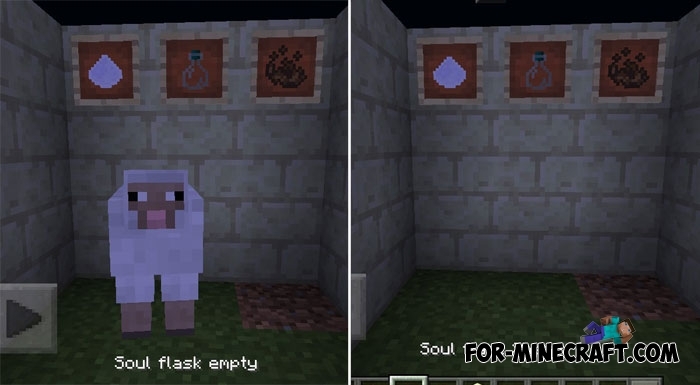 In addition to the transport function, the soul flasks perfectly replace the spawn eggs in the creative mode and at the same time preserve the atmosphere of survival. How to get the flasks? You will need two ingredients: soul blend and ectoplasm. Ectoplasm is obtained after the death of any being, hunt for mobs and collect it. To get soul blend you need: 1 dirt + 1 ectoplasm + sand of souls + blaze powder. How to install the Soul Flasks mod?